So, you have a new Apple Watch. A hearty congratulations to you! No doubt you’ve heard about messaging, email, and the health apps. 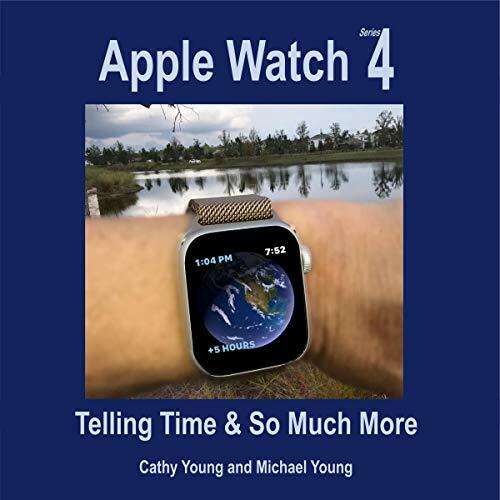 The visionary Apple Watch is, at last, poised to take on the world in this audiobook! I want you to feel comfortable with all aspects of your watch in an environment that encourages you to learn painlessly at your own pace. My goal is to help you enjoy the wonder of discovering your Apple Watch. Teach you how to use all the features of your Apple Watch. I say “all”. As far as I know, I found every darned one of them, but don’t sue me if I missed one. Demonstrate the cool and awe-inspiring features of the Apple Watch. These aren’t random tips and tricks. Rather, I have showcased them in a way that lets you find them while exploring a particular feature or topic. Help you find what you want, when you want it. The organized and detailed table of contents includes more than 200 topics. Skip around to your heart’s content. Inspire you with more than 111 third-party apps. A few of the categories include entertainment, productivity, sports, photography, and games. We’ll also cover integration platforms like IFTTT, which open up the possibility of unlimited applications. Focus on the engineering and Apple platforms behind the Apple Watch. The physical device includes the heart-rate monitor, accelerometer, gyroscope, and Apple’s Force Touch technology. Behind the scenes, learn how Apple is partnering with businesses to extend their HealthKit, HomeKit, and GymKit platforms to enhance your experience for years to come. List 30 common troubleshooting and maintenance suggestions. While much of the content applies equally to older models, please know that I didn’t attempt to cover discontinued features like “glances” or “time travel”. As a final selling point, I make an intentional effort to avoid a few of my pet peeves - and those pertain to incomplete instructions. I frequently see directions such as “tap and go to settings”, but they leave novice users asking, “tap where?” In another example I saw, the instructions mentioned a workout playlist and how to enable it - but assumed nothing went awry (and something always goes awry). I intend to cover those bases for you. And if I do by chance make the mistake of omitting a critical detail anywhere in this audiobook, know that I was probably distracted by my Apple Watch telling me to get moving or to breathe. I apologize ahead of time; it wasn’t intentional.